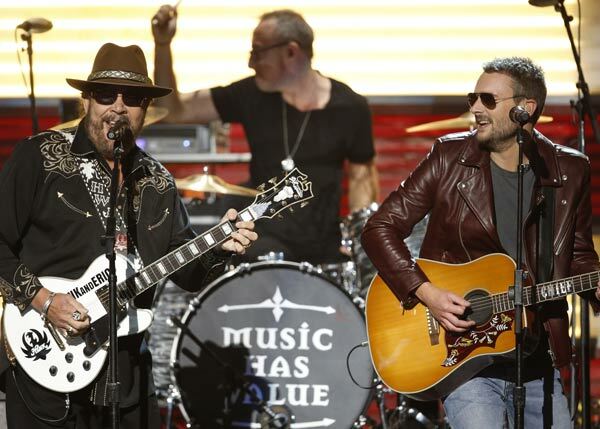 NASHVILLE, Tenn. (November 5, 2015) – Hank Williams Jr. blends rowdiness and twang with Eric Church on his new single “Are You Ready for the Country,” available now on digital retailers. The rowdy pair debuted the first single off Hank Jr.’s upcoming album IT’S ABOUT TIME, available for preorder, during the 49th Annual CMA Awards. Hank Jr.’s stellar performance of “Are You Ready for the Country,” written by Neil Young but made famous by mentor Waylon Jennings in 1976, set the tone for the country music awards show that included a throwback to outlaw and traditional country. George Jones received rousing applause when Nancy Jones accepted the Joe Talbot Award, which honors outstanding leadership and contributions to the preservation of country music, on his behalf. Jones was also revered during Chris Stapleton’s performance of Jones’ 1983 hit “Tennessee Whiskey.” The audience also paid tribute to Johnny Cash when his son, John Carter Cash, accepted the Willie Nelson Lifetime Achievement Award. Fans still have a chance to own Hank Jr.’s guitar he played during the CMA performance by visiting HANKandERIC.com. The winner of the #HANKandERIC sweepstakes will be announced on December 4 via social media. When fans preorder IT’S ABOUT TIME, they’ll receive four instant tracks during December and January prior to the album’s release. IT’S ABOUT TIME is Hank’s 37th album in his five-decade career. He continues to add accolades to an extremely impressive resume, which has spawned 70 million albums sold worldwide, 20 gold albums, six platinum albums and 13 chart-topping albums. Hank has been named ACM Entertainer of the Year, CMA Entertainer of the Year and BMI Icon in addition to winning a GRAMMY and being inducted into the Nashville Songwriters Hall of Fame.